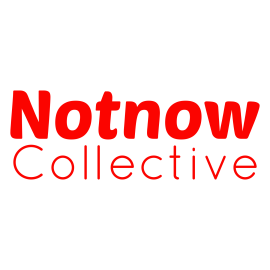 Notnow Collective makes baby-friendly and baby-proof work for adults. We welcome babies both to our audiences and working process and are committed to addressing the best practices for parents working in the arts. Retro looking front cover of a comic with a flying superhero dressed in casual clothing, catching a flying baby in the sling, whilst the other child travels in the bath in distance. Breads, lego bricks and money notes flying about.